The common name of this plant, of course, comes from the distinctive stem, which has vertical ridges that are sometimes described as “wings”. (See the photos below.) The stem is usually unbranched, and the fast-growing plant can eventually reach great heights– up to 8 or 10 feet. 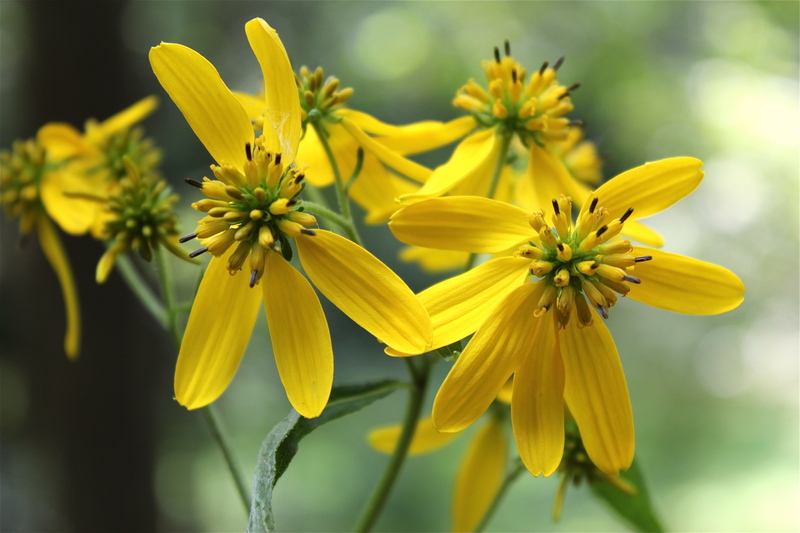 Wingstem is sometimes called yellow ironweed because it resembles New York ironweed in a couple of ways: it is tall, tough, grows in moist places, has lanceolate leaves like ironweed and blooms in late summer. But wingstem is definitely not a kind of ironweed. The flowers are distinctly different, in both shape and color, and the stem of wingstem is “winged” whereas on ironweed it is not. Wing stem leaves are alternate, lanceolate and very coarse to the touch (like sandpaper). The leaves at the top of the plant tend to be smaller, with smoother margins, whereas the lower leaves can grow quite large (8 inches) and have toothed margins. A nectar-drinking tachina fly (Archytas apicifer) on Wingstem. His belly is full of nectar! The flowers of this aster grow in loose clusters at the top of the plant. They look like small, bright-yellow sunflowers, but the petals (ray flowers) vary in number and always droop downward in a haphazard fashion. The erect disk flowers protrude upward from the center of the flower. Compare wingstem to a similar wildflower in the same genus: yellow crownbeard, Verbesina occidentals. On that page, I compare their features side by side. Wingstem is found in moist, sunny places, especially near woodlands. It can grow into dense colonies and is resistant to deer, making it a very competitive plant in open spaces. As you can see in the photo gallery below, bees, wasps, butterflies, and other pollinators love wingstem. Bloom time is August through fall. Speaking of how tall and tough this plant is, here is a large queen snake warming itself in the sun, high at the top of a wingstem plant. This photo was taken by Brian Murphy out at his farm in Craig County. I just moved to a vastly untouched small farm outside of Elkin, NC. I can sense when plants aremedicinal, but can’t ID them very well, as I havent had much practical application, only book learning. Do you come to peoples’ homes and help themlearn about their flora? I’d lovethe chance to learn about the variety here and how to nurture it. There are many wonderful plants here, like the cohosh, ginseng, sassafras, sourwood, mullein, geranium, crownbeard or wingstem – not sure if i have either or just both, maypop, passion flower, to name a few. i’d love to have nature walks here, but need to understand it better. Thanks for your valuable blog. Sorry, I can’t do that. But your place sounds wonderful. Enjoy it!